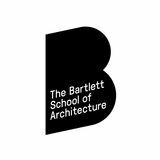 The Bartlett School of Architecture, one of the most renowned international schools, based in a truly global city is a fitting place from which to interrogate the wider challenges of architecture and cities in a rapidly transforming world. It is from this perspective that we undertook our investigation of informal settlements in Rio in 2015. Given both the prominence and the permanence of this particular urban form in that city our hypothesis might easily be stated as ‘the favela IS the city’. The contributions which follow provide a glimpse into a ‘self-organising’ urban system accompanied by speculations about the potential for intervention and what forms those interventions might take. Since its inception in the mid 70s, the educational programme of MSc Spatial Design Architecture & Cities (formerly Advanced Architectural Studies) has looked at architectural research through the prism of space, combining analytical theories and methods known as space syntax. Since 2014-15, the MSc course has integrated design-research in the form of a studio (E-merging Design Research), with the view to provoke thinking about the intersection between generative and analytical approaches. The wider purpose is to overcome the fragmentation of architectural research into an analytical (science-based) and a speculative (artsbased) practice. This publication presents the studio work produced in this context, currently focused on the city of Rio de Janeiro, Brazil. International seminar RIO@RIO organised by Sophia Psarra, Kimon Krenz, Fani Kostourou and Cauê Capillé, at GSAPP Columbia University’s Studio-X in Rio de Janeiro. Photo by Raul Corrêa-Smith. Discussion session at the international seminar RIO@RIO with Pedro Rivera, Vinicius Netto and Guilherme Lassance at GSAPP Columbia Universityâ&#x20AC;&#x2122;s Studio X in Rio de Janeiro. Photo by Raul CorrĂŞa-Smith. any urban condition more important than slavishly relying on metaphors is to understand conditions on the ground. The E-merging Design Research studio travelled to Rio de Janeiro to explore these issues in the context of a design project focusing on Rocinha, one of the informal settlements in the city. Pejoratively referred to as ‘slums’, these so called favelas were initially considered as a temporary irregularity, but were soon seen as continuing evidence of institutional failure. More recently, favelas are considered as examples of the ways in which communities have in an autonomous and resourceful way created their own settlements. The main purpose of the studio was to explore alternative approaches to improve life in the favelas through spatial, social, economic and ecological innovation. Today, a third of the world’s population has shifted from rural agricultural life to urban spaces at the edges of cities. Between 2007 and 2050, the world’s cities will absorb an additional 3.1 billion of people in the slums, the suburbs and immigrant quarters of both the Western and the developing worlds (Saunders, 2010). As a result, there has been an intensification of interest in understanding the spatial, economic and social models by which formal and informal settlements are produced for a resilient and sustainable future. Increasingly official agencies of city administration and design practice regard informal places not as static sites of poverty and conflict, but as dynamic areas of human ingenuity and social capital. Venice Hospital, Cedric Price’s Fun Palace and Pop-up Parliament, John Week and Llewelyn Davies’ notion of indeterminacy at Northwick Park Hospital building, and pop notions of transience and expendability. Paul Barker, the former editor of New Society, claimed that the Journal ‘tried to see the world as it was rather than as it ought to be’2, that is, away from grand manifestos and utopian blueprints of modernism imposed from above. He wrote together with Reyner Banham, Peter Hall and Cedric Price ‘Non-Plan: an experiment in freedom’,3 an extraordinary article, in which by taking a segment of the English countryside each they hypothesized what might happen if there was no planning at all. community’s interests, and planting the hope that architecture and space can have political agency. In the favelas there has been an analogous development of such collaborative and resilient activities, which further enabled through the digital may point the way to new models of engagement with architecture and the city. to sidestep more systemic problems, social, political, and economic situations. At the same time, a number of disciplines are brought upon to bear on cities and architecture. Cities and buildings are no longer the subject of only planners, architects or urban designers, but also of artists, engineers, social scientists, and in many cases journalists. Qualitative research, theories and analytical models, such as space syntax, are often employed based on various kinds of data that can inform evidence-based design. Today many professionals talk about the built environment as a complex system, and bring evidence from analytical studies to justify design decisions. Yet, when we have to think about the city or architecture innovatively, we should not only be informed by evidence, but also radically re-think them and come with new propositions. authorless settlements, between the acres of new infrastructures and the thousands of relocations to make way for Olympic projects fundamental questions need to be kept in mind: – Can architecture reclaim its social and political role as a discipline? – Can spatial dimensions alone assure the success of social programmes? – Can theoretical and analytical approaches such as space syntax enable architects to be agents of social and political change? What aspects should these approaches address so as to strengthen architecture’s social and political agency? – How does the designer step back from dictating the form of a building or a city over time? – How does science as the epistemological model with its assumed detached objectivity relate to social and political values and the need to service ethical imperatives? – How do we navigate between the modernist model of architecture and widely spread processes of informal settlements and urbanisation? – Can architecture have the tools to propose an alternative idea about the city (at a time where cities are being shaped by global economics at a speed beyond municipal control)? – How do we overcome the gap between the iconic architectural project and the city as a by-product of urban policy and development? – If one third of the world’s populations have shifted from the country to the periphery of the city, what can we learn from their resilience and resourcefulness? – Acknowledging the informal as a vital part of the city’s social capital and ecosystem. – Reversing the tide of segregation and rebuilding cohesion. – Addressing challenges and developing alternative approaches to favela upgrading that foster spatial, social, economic and ecological innovation. The primary concern in this category was nodal points between different types of infrastructure, when systems interdepend and collide (transportation, markets, educational, social infrastructure, etc.) The emphasis was on shared access to resources and modes of production that ensure that urban networks can be established, evolve and maintained over time. Students selected ‘sites’ in Rocinha so as to address a variety of spatial conditions. The term ‘sites’ has broader meaning that is not confined to a single geographical location, social category, clear boundaries, morphological or economic definition. Sites were chosen either by virtue of being certain types of spaces (such as public spaces) or places that might be at different locations but are linked together by sharing network-like properties. Performance: Thematic threads T1: Social and economical practices – sociality employment and micro-economies of the collective. T2: Modes of citizenship, identity and sharing (social programmes, spatial and social connectors). T3: Ecology and infrastructural systems – modes of co-habitation, equal access to resources, sustainable urban eco-systems. The purpose was to construct self-sustaining urban nuclei interconnected with other urban nuclei, with multiple uses and common collective spaces. Engaging areas situated between the informal settlements and the official urban fabric. For spatial and social integration to be addressed, it first needs to be defined. The design had to take into account physical characteristics and socio-economic models of exchange from both sides. 1	Colin Ward, ‘Anarchy and architecture: A personal record’, in eds. Jonathan Hughes and Simon Sadler, Non-Plan, Abington and NewYork: Architectural Press, 2000. 2	ibid. 3	R. Banham, P. Barker, P. Hall, C. Price, ‘Non-Plan: An experiment in freedom’, New Society. 13, no. 338,. 20 March 1969, pp, 435-443. 4	Where agricultural depression has enabled low	income city-dwellers to build their own shack, chalet,	chicken-farm holiday home or retirement idyll, the lessons of the squatters campaign. 5	http://www.spatialagency.net 6	http://bombmagazine.org/article/7096/stan-allen accessed 11 July 2015.
and groups according to sites and crossover themes. The design projects were set within the context of theories and methods that are explored in the MSc SDAC programme. Students used analytic techniques to interrogate and develop their design ideas. Technical terms used in their project descriptions are defined in the glossary section at the end of this volume. Map 1 (page 3), shows the transportation infrastructure, the location of favelas and the Olympic sites superimposed with income data for the metropolitan region of Rio de Janeiro. Credits: Chun Wing Fok. Photos 1-5 (pages 5-8, 11) show the favela of Rocinha in Rio de Janeiro, Brazil during students’ fieldtrip in February 2015. Credits and editing: Xiao Hu. Network Acupuncture Space syntax analysis shows that the proposed cable car stations are currently not well connected to the future street system, which leads to a possibility of a separation between the top-down infrastructure (cable car) and the street infrastructure supported by the street network. A rigorous design research process is used to identify and transform five street segments, in order to achieve a better integration between these two infrastructural systems. by the segment angular analysis will be widened contributing to the intensification of these flows. An even more integrated network of the combined system will emerge in this way. Cable Car Station There are six cable car stations to be built. The project proposes that each should have its strong topographical character and different unique identity. The areas under the elevated stations will become the civic spaces that cohere the transpatial solidarity (see glossary) of Rocinha’s community. The cable station is the ‘switch’ between two street networks and the imposed infrastructure. It is necessary to redesign the stations so that a faster transit can be achieved. Double helix ramps are introduced so as to provide a faster way to leave the station. The centre of the helix structure can be turned into a performance space, which further enhances the function of the public space. The original cable car network cannot cover the area with altitude higher than 175m. To strengthen the network coverage, urban surgery is applied by proposing one more cable car station and a new escalator. Under the proposed condition, cyclists and delivery boys can ride down to anywhere after they reach the stations in higher altitude. Hacking the Ideology To divert the flow of public money, and persuade the government to redesign the stations and cabin, the ideology of the cable car and the way in which the cable car is marketed have to be hacked. Through the design the cable car is now promoted as a sustainable means of transportation because it can reduce greenhouse gas emissions. The design not only hacks the ideology but also greens the favela as more people can use bicycles to commute. Notes: The idea of hacking infrastructure is inspired by Keller Easterling’s Extrastatecraft: The power of infrastructural space (London, Brooklyn, New York: Verso, 2015). ‘Switch’ is one of the active forms identified by Easterling, the other two being the ‘multiplier’ and ‘topology’. enhance spontaneous social interactions between inhabitants and visitors. The projectâ&#x20AC;&#x2122;s aim is to provide a sustainable and systemic programme of education that works as an alternative to the existing voyeuristic tourism. This programme does not only provide economical gain, but also cultural exchange improving or cultivating opportunities for new skills for inhabitants and visitors. with an average area of 3.94 sq. m. An oneby-one analysis of these spaces helped to organise them into clusters according to shape, area, relation with the surroundings and their choice value (see glossary). In this way it was possible to establish a systemic approach to their design. The project proposes that the cluster of open spaces situated in the foreground network should function as active public spaces. They will be planted with Brazilian plants which are of low maintenance and do not need special care in order to grow. The cluster of spaces in the background network on the other hand, will be used for growing food, providing a network of spaces for locally based urban agriculture. Considering the existing urban equipment of Rocinha (such as benches and chess tables,) the spaces near the retail zone as well as those in residential areas can host urban furniture with adaptable shapes and sizes. Green walls, waste bins, and stands can offer the necessary conditions for multiple types of services and uses gradually creating a network that can expand to the whole favela. Small interventions in a systemic approach will create larger scale effects and a self-ordered process of well-being of people in Rocinha. Even though Rioâ&#x20AC;&#x2122;s favelas are fully integrated into the cityâ&#x20AC;&#x2122;s geography and economy, plans to evict the residents are presented on a regular basis. This project considers the favelas and Rocinha in particular as an essential part of the city. To consolidate it in the long term, the housing conditions in many parts of the settlement must be improved, as sanitation and ventilation issues still lead to a series of diseases considerably lowering life expectancy. In many parts, the density of the existing urban fabric does not allow a long-term improvement of houses and their hygienic conditions. Therefore, new housing must be considered, which is the focus of this design project. roof terraces in Rocinha, on every level of the housing project allows the residents to establish different kinds of micro-economic activities. Inspiration for this idea comes from the existing roof terraces of Rocinha, which are often rented generating alternative and informal sources of income. Top-down meets bottom-up The belief that public authorities and local communities can learn from each other is the base for the implementation approach of the project that brings together the strengths of different stakeholders. While the public intervention provides the basic structure and services, the residents lease a part of this structure and take over the construction of their living space. At the same time, collaboration with private enterprises can help finance the project. In this way, multiple stakeholders help to develop a long-term model for favela housing, which goes beyond an individual project, an architectural object, an architect designer or a specific user. As top-down meets bottom-up, the state meets the community, and architectural authorship meets the self-ordered city. Analysis of different ways of space creation. Categorised by monetary investment, time investment and manpower. The ‘Social Anchor‘ Neighbours engage in micro-library on roof terrace. The harvested fruit and vegs are partly distributed to the other cooperative houses. The Tourist Attractor The exposed location of the building its roof terrace. The cooperative has thus decided to build three temporary hostel-tents for tourists on the roof terrace to generate income. The ‘Cash Cow‘ tion at the main street (foreground network) make a commercial use very helps to fund and support other cooperative houses. The ‘Newcomer‘ A group of people has approached the cooperative to initiate a new project. of the other houses help the newcoway. This construction site is on hold as a some of the participating members have unexpectedly left the project. The other cooperative houses help the remaining families to re-structure their plans and to secure the site. transportation stops along the main street. By overlapping observations of human activity and shading analysis (Ecotect) in the chosen places, it became clear that people tend to gather under shaded areas and these are the places where they perform most of the outdoor activities in Rocinha. For fully testing and completing the selection procedure, an interface map of the whole main street in Rocinha was developed and combined with GIS data of commercial points, transportation stops, and public spaces. Six locations were eventually selected on the basis of this mapping. The basic design principles were multifunctional, symbolic, flexible, sociable, and cultural. The design choices concerned simple local materials consisting of a common yet durable synthetic membrane. Made from Polypropylene (PP),Â it is a lightweight, permeable and refractive material that is easy to install, fold, store and keep clean. Due to its affordability and availability, the membrane has already been a rather popular shading device over stands in open markets and shopÂ extensions/ porches in Brazil. What are the findings? Local businesses need shading, especially for vendors. network, using thus the ability of the street network for natural surveillance. b. A hybrid building/urban typology that mixes football space with housing, generating a new type: the ‘football field-housing’. These conditions allow a direct connection between the proposed spaces, the main thoroughfares of movement, the schools and the residential areas. The project uses the theatrical characteristics of urban voids and the supervisory role of the houses over the play fields. Three flat typologies are proposed: studio, two bedroom, and threebedroom flats. The ground level is occupied by the football field and provides access to the flats on the first and second levels above, with the possibility for further expansion according to family needs. The flats are connected with the street level through a bridge that works as a filter between the privacy of the home and the public space of the street. The relation of the football field with the foreground network is enhanced by taking advantage of the topographical conditions of Rocinha, providing seating areas that use the level differences of the terrain. The connection with the background street network is enhanced by the provision of a building that works as an ‘attractor’, strengthening the hybrid programme of the proposal. Four attractors-typologies are proposed: church, school, commercial and community buildings. Each of them has a different ‘permeability’ configuration to facilitate its integration with the housing and the football field, generating a complete hybrid system. The existing football fields located in the background network are changed to green areas. These areas can be used by a wide range of age groups, reducing the exposure of children to crime. The proposed spatial relations between schools, the ‘football field-housing’ and the new green places will strengthen the use levels of the background system and the sense of community over space and time. The Issue of Water The project focuses on water as a resource. Residents in Rocinha have been fighting for water for 15 years. Although the government has set a water pumping station and guaranteed that the majority of people get access to basic water facilities, a large part of people still lack indoor running water. in Rocinha. The commercial units can get access to water, while the residential ones use water tanks which store water that is pumped once every week. It is very hard for residents to access water in the most segregated areas of the settlement. An interlocking pipe system is proposed that allows residents to participate in building the water distribution network. In the first phase of the project the pipes can link to the water tanks so as to cause minimum disturbance to the existing way of life. Fieldwork – ‘Do-it-Yourself’ Infrastructure During the field-work in Rocinha, it was understood that it is more realistic and efficient to engage the residents in ‘do-ityourself’ infrastructure. Electricity wires, internet cables and water pipes are installed and modified by the local inhabitants themselves. Space Syntax Methodology – Building a Systematic Strategy The water pipes extend from the water pumping station and follow the foreground street network. As the commercial area needs continuous water resource, the foreground parts of the pipes can be made more fixed and used as a frame to work with in the future. In a later phase the residents can develop and connect to the primary pipes by themselves helping the residential areas gain indoor water. Moreover, the project uses metric step depth (see glossary) to find several areas, which are suitable for setting water points. These points are intended to serve as large areas as possible. Capability Approach and Archigram Therefore, a successful water distribution should make use of the inhabitants existing experience in developing their own infrastructure. The project is inspired by the design thinking of Archigram, according to which a design project should be flexible and changeable allowing every one to access it and participate in its transformation. The project explores the possibilities inherent in this thinking in an informal community, such as Rocinha. Although Archigram may represent a Western understanding of space and society, their ideas might prove to be more useful in a different context. Rocinha hydrology study. Normalised Choice Radius 1600 overlaid with Stream Order. locations were identified to locate water pressure boosters. to be concentrated â&#x20AC;&#x201C; residents can create neighbourhood gardens making use of the sewage and rainwater to create compost for food production. On the other hand, in the foreground network (see glossary), they can have public green spaces or parks, which are generally lacking in Rocinha. Controlled and maintained by the inhabitants, both neighbourhood gardens and public parks can address the flood problem, while also enhancing mutual support and the sense of social cohesion. of public space or schools. At the private level, the pipes can also allow residents to carry out everyday tasks, such as hanging their clothes, linking with a rain collector and using the water to water their plants. Creating Networks Combined with the existing cultural networks, the Celebrate Rocinha project will enhance the cultural life and influence peoples’ identity and daily life, creating forms of transpatial solidarity (see glossary). The project proposes a network of spaces that enables various new cultural activities to emerge, and existing ones to grow more lively and stronger. The selected sites are close to the small cultural centre at the entrance of Rocinha, the Biblioteca Parque da Rocinha at the centre of the settlement, and to the existing schools and surrounding residential areas. Booming Public Space Rocinha doesn’t have many public spaces. This means that most people meet inside each other’s homes and with their families. While the proposed cultural programmes serve transpatial solidarity, the project’s spaces create spatial solidarity (see glossary). The Celebrate Rocinha project provides open public space and improved connections with the existing street network, for everybody passing by or having spare time to enjoy live concerts, performances, food and parties. Spatial solidarities are the outcomes of spatial proximity, enhanced spatial connections, and integrated spatial networks that enable social encounters over and above the initial reason for which people are present in a particular space. Enabling and Generating Activities Initial research in Rocinha shows that a large variety of local cultural activities exist but are usually hidden behind the main streets. These should be enhanced and become visible. The Celebrate Rocinha project works as a culture boomer to generate different kinds of practices and events (music, art, studio, languages). It provides a large open space for people to gather, entertain, communicate and cooperate. It works less through the provision of social programmes, and more through the street network and the natural movement patterns. The expectation is that by offering a basic infrastructure strategically located where people are, activities will develop spontaneously and informally in similar ways to the local culture. Rooted deeply in Rocinha The Celebrate Rocinha project emerges from the needs of people and adapts in their local sites. It is not intended to be a fixed building, but an enabling ‘platform’ offered to the community, which can naturally continue developing and flourishing over time. During the field trip it became apparent that Rocinha has almost no public space. There is no area where people can gather and benefit from access to diverse public amenities. Therefore, the design work focused on improving the capacity of space to serve diverse activities and social gatherings. The emphasis is on increasing the possibilities for social encounters, necessary for strengthening the spatial and social ecology in the favela. Looking for potential sites for the development of public space, a number of places were selected, principally falling into two main categories. First, sites in the foreground street network (see glossary), which attracts a great deal of movement and circulation; second, sites in the background network (see glossary), which covers quieter residential areas. The former are chosen so as to be next to existing bus stops and transportation hubs, since they could enliven the new public spaces by being destinations that attract large numbers of people. The latter were found in residential areas where neighbourhood activities could take place, providing quiet places for play and social gatherings. Some of the chosen sites were observed during fieldwork in order to build a detailed picture of human activity and the different kinds of users. These observation data were employed together with the results of the spatial analysis, in order to better understand what people in Rocinha do when they are in the streets and how they use the outdoor areas. The proposed system consists of a flexible wooden primary structure that is squeezed into left over urban spaces similar to the logic of ‘pet architecture’ developed by Atelier Bow Wow (2001). This modular system is based on a standardised grid of 4x4 metres that allows for a seamless horizontal and vertical development according to the needs of users and the availability of space. While some modules can accommodate functional elements and popular social practices that were previously exposed to harsh weather conditions – rubbish storage, play grounds, staircase, simple signs or green areas –, other modules can be appropriated by the inhabitants of the favela themselves: shading, hanging clothes, billboards and shop extensions. Modularity of the design concept. Gradual appropriation of the modules by the inhabitants over time. > 100% ( > 45ª) Areas where less than 34-100% (19-45º) 50% of households have adequate sewage. Reported problems on UNICEF map. 1. The foreground network (identified by normalised angular choice radius 800 metres, see glossary) is overlapped with the slope map in order to select the paths that optimise the collection system for the whole community. Recycling centres are placed on the foreground network and next to existing facilities so as to take advantage of the existing movement patterns and to be reached within a 200 metres walk from all households. For each location, the project identifies types of garbage, the facilities the recycling centres are related to, and the location within the network to determine the scale of intervention and the specific programme. The recycling centres are intentionally related to existing facilities, in order to take advantage of the existing spatial and movement routines. According to Hillier (2015), the creation of spatially dispersed networks should be a priority in the city building process. By choosing strategic points of the foreground network, recycling centres open up possibilities for virtual community, co-presence and encounters between people living in the surrounding area, creating and strengthening new spatial solidarities. The everyday use of recycling centres is intended to become a new ‘place ballet’ (Jacobs 1961). Daily social choreographies though individual space-time routines can contribute to the liveliness and safety of public space by means of ‘natural surveillance’, and enhance mutual trust. The fact that the community actively participates in the waste management system can foster their attachment to the project and the place. The waste management system as a whole intends to promote the human development of the inhabitants of Rocinha. Human development depends on ‘beings and doings’ and ‘wellbeing’ is defined in terms of what people are able to do (Sen 1999). The project aims at contributing to the existing economic and cultural richness and to the improvement of health and environmental conditions by promoting activities and events related to a new waste management system that allows people, especially vulnerable populations, to become actively involved. events related to the recycling system so as to enhance transpatial solidarities. This calendar is based on a range of activities for different social groups. From training workshops to street markets, these events – sometimes promoted by public or private entities and sometimes by the community itself - bring people with the same interests, age or condition together. This strategy expands the social networks of the inhabitants over the whole of Rocinha and beyond, making the settlement a more diverse and socially rich environment. Glossary of terms As Object: Or, how spatial laws mediate the social construction of urban space” , In: Proceedings of 3rd International Space Syntax Symposium, Atlanta, USA, pp. 02.21; Hillier, B. (1996) Space is the Machine: A configurational Theory of Architecture, Cambridge: Cambridge University Press. pp. vi. Background network The background network is part of a theoretical conception of a generic city as being comprised of a foreground network of linked centres at all scales set into a background network of residential space. The background network is said to vary across residential of spatial areas whole spatial cultures, depending on the way in which that culture seeks to restrain and structure co-presence between, say, inhabitants and strangers or men and women. Sources Hillier, B. (2001) “A Theory of the City As Object: Or, how spatial laws...space”, In Proceedings of 3rd International Space Syntax Symposium, Atlanta, USA, pp. 02.21; Hillier, B. & Netto, V (2002) “Society Seen Through the Prism of Space: Outline of a theory of society and space”, Urban Design International 7, 181-203. pp. 182; Hillier, B. (1996) Space is the Machine: A configurational Theory of Architecture, Cambridge: Cambridge University Press. pp. vi. Movement economy The theory of the movement economy , built on the notion of natural movement, proposes that evolving space organisation in settlements first generates the distribution pattern of busier and quieter movement pattern flows, which then influence land use choices, and these in turn generate multiplier effects on movement with further feedback on land use choices and the local grid as it adapts itself to more intensive development. Sources Hillier, B. (1996) Space is the Machine: A configurational Theory of Architecture, Cambridge: Cambridge University Press. pp. 125-127. Normalised angular choice Normalised choice aims to solve the paradox that segregated designs add more total (and average) choice to the system than integrated ones. It divides total choice by total depth for each segment in the system. This adjusts choice values according to the depth of each segment in the system, since the more segregated is, the more its choice value will be reduced by being divided by a higher total depth number. This would seem to have the effect of measuring choice in a cost-benefit way. Sources Hillier, B., Yang, T. & Turner, A. (2012) “Normalising Least Angle Choice in DepthMap - and how it opens new perspectives on the global and local analysis of city space”, The Journal of Space Syntax, Vol 3, No 2, pp. 105-193.
example, it is used to select all spaces within 1000m from a root space. Sources Turner, A. (2008) “Getting Serious with DepthMap: Segment Analysis and Scripting”. [PowerPoint slides]. Presented at Lecture at University College London. Segment analysis Segment analysis is any analysis of a segment map, including topological, angular and metric analyses. It is normally undertaken in DepthMap software. Sources Turner, A. (2004) Depthmap 4: a researcher’s handbook. London: Bartlett School of Graduate Studies, UCL. pp. 26. Spatial-transpatial solidarity Studying the social logic of space, Hillier and Hanson suggest that every society has spatial groups of people that live and move in greater proximity to each other than to others, and conceptual (transpatial) groups based on socially or professionally similar people. The groups of the second kind are conceptual because they do not depend on spatial proximity, although they could coincide with spatial groupings. The former are spatial because they rely on spatial proximity for their social relations. Sources Hillier, B. & Hanson, J. (1984) The Social Logic of Space, Cambridge: Cambridge University Press. Step depth Step depth, also called point depth in the previous version of DepthMap, follows the shortest path from the selected root line (or segment) to all other lines (or segments) within the system, and the path length is recorded on the line (or segment). Sources Turner, A. (2004) Depthmap 4: a researcher’s handbook. London: Bartlett School of Graduate Studies, UCL. pp. 28. Note: The definition of Spatial-transpatial solidarity has been provided by the editors. references Hillier, B. (2015) Space is the Machine: A configurational Theory of Architecture, available from: http://spaceisthemachine.com, [Accessed: 19 October 2015]. Allen, S. (1997) “From Object To Field”, In: Architecture After Geometry, Architectural Design Profile No.127. May-June, 24-32. Reprinted as: Allen, S. (1999) “Field Conditions”, In: Points+Lines: Diagrams and Projects for the City, New York: Princeton Architectural Press. Hillier, B., Burdett, R., Peponis, J. & Penn, A. (1987) “Creating Life: Or, Does Architecture Determine Anything?”, In: Architecture et Comportement/ Architecture and Behaviour, 3 (3), 233-250. pp.237. Allen, S. (1999) Infrastructural Urbanism, In: Points+Lines: Diagrams and Projects for the City, New York: Princeton Architectural Press. Hillier, B. (2001) “A Theory of the City as Object: Or, how spatial laws mediate the social construction of urban space”, In: Proceedings of 3rd International Space Syntax Symposium Atlanta 2001, 02.1-02.28, pp. 02.21. Atelier Bow Wow (2001) Pet Architecture Guide Book, Japan: World Photo Press. Easterling, K. (2015) Extrastatecraft – The power of infrastructural space, London, New York: Verso. Hillier, B. (2001) “A Theory of the City As Object: Or, how spatial laws mediate the social construction of urban space”, In: Proceedings of 3rd International Space Syntax Symposium, Atlanta, USA, pp. 02.21. Hillier, B., Yang, T. & Turner, A. (2012) “Normalising Least Angle Choice in DepthMap - and how it opens new perspectives on the global and local analysis of city space”, The Journal of Space Syntax, Vol 3, No 2, 105-193. Hillier, B. & Hanson, J. (1984) The Social Logic of Space, Cambridge: Cambridge University Press. Jacobs, J. (1961) The Death and Life of Great American Cities, New York: Random House. Hillier, B. & Netto, V. (2002) “Society Seen Through the Prism of Space: Outline of a theory of society and space”, Urban Design International 7, 181-203. pp. 182. Krenz, K., Kostourou, F., Psarra, S. and Capille, C. (forthcoming, 2015) “Understanding the City as a Whole: An Integrative Analysis of Rio de Janeiro and its Informal Settlements”, In: Proceedings of 22nd ISUF International Conference, City as Organism: New Visions For Urban Life, Faculty of Architecture, ‘Sapienza’ University of Rome, Italy. Hillier, B. (1996) Space is the Machine: A configurational Theory of Architecture, Cambridge: Cambridge University Press. McGuirk, J. (2014) Radical Cities: Across Latin America in search of a new architecture, London, New York: Verso. Psarra, S., Kostourou, F., Krenz, K. (forthcoming 2015) “Designed and Emergent Tectonics: Resituating Architectural Knowledge”, In: Proceedings of ACSA Fall Conference, eds. Hubeli, R. and Larsen, J., Syracuse School of Architecture, USA. Rifkin, J. (2014) The Zero Marginal Cost Society: The internet of things, the collaborative commons, and the eclipse of capitalism, New York: Palgrave Macmillan. Saunders, D. (2010) Arrival City: How the largest migration is reshaping out world, London: William Heinenmann. Sen, A. (1999) Commodities and Capabilities, In: OUP Catalogue. Smithson, A. (1974) “How to recognize and read Mat-Building: Mainstream architecture as it has developed towards mat-building”, Architectural Design, (Sept.), 573-590. Turner, A. (2004) Depthmap 4: a researcher’s handbook. London: Bartlett School of Graduate Studies, UCL. pp. 26. Turner, A. (2008) “Getting Serious with DepthMap: Segment Analysis and Scripting”. [PowerPoint slides]. Presented at Lecture at University College London. 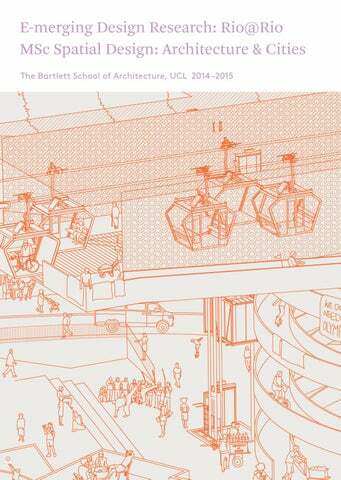 Copyright © 2015 The Bartlett School of Architecture, UCL No part of this publication may be reproduced or transmitted in any form or by any means, electronic or mechanical, including photocopy, recording or any information storage and retrieval system, without permission in writing from the publisher. ISBN: 9-780992-948573 For more information in the MSc Spatial Design: Architecture & Cities programme and the E-merging Design Research module at the Bartlett School of Architecture, UCL, visit http://www.bartlett.ucl.ac.uk/ space-syntax/programmes/mres-msc/msc-spatialdesign.